In a restart of the Jazirah Storm operation, fighters of the Syrian Democratic Forces’ majority-Arab Deir Ezzor Military Council made a major advance along the Iraqi border. 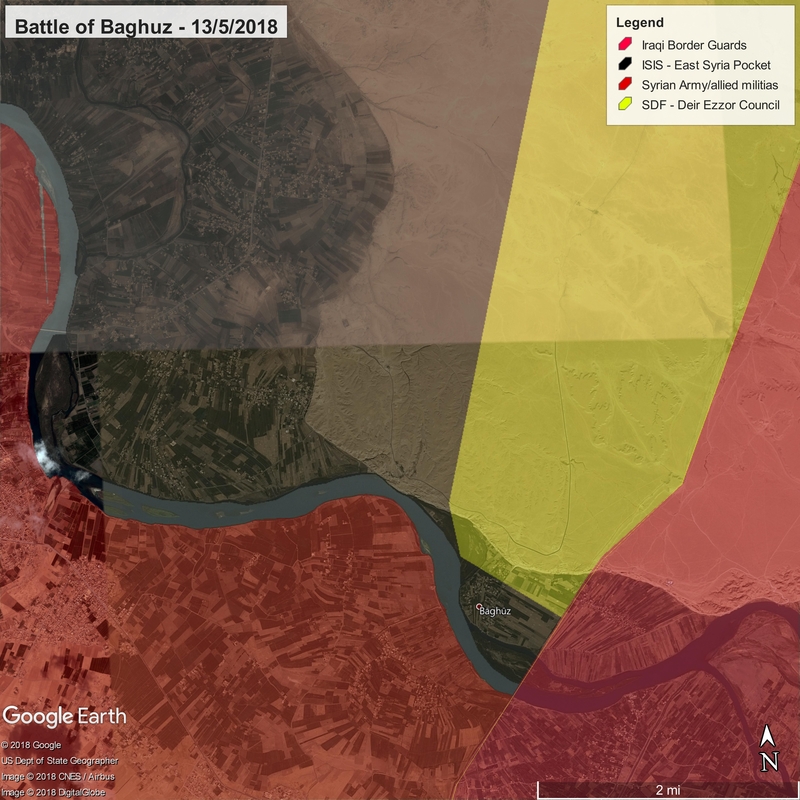 Slowly creeping up on the small border village of Baghuz, they infiltrated the settlement and captured most of it from the ISIS garrison there. Many ISIS fighters fled the town to regroup in the hilly terrain northwest of the village to launch a counterattack against SDF forces, although no counterattack has yet occurred. This advance is significant because Iraqi forces coordinated significantly with SDF forces, allowing them safe passage along the edge of the frontier. The Iran-aligned Iraqi government has not typically been friendly with the historically-Kurdish SDF, although the entirely Arab composition of forces participating in this assault may have facilitated Iraqi cooperation. There is no doubt that this cooperation was urged by the US. SDF fighters have a second gap to jump before they can continue taking territory along the river. The town of Baghuz Fawqani (western Baghuz) lies to the west of rough terrain which the SDF must capture first. However, once the SDF takes possession of the high ground, they can inflict damage on the ISIS fighters in the valley below and force a victory. This is why ISIS is intent on focusing the fight on the high ground rather than fighting in the valley, where they would be at a disadvantage.